Tameshigiri – test cutting. Photo credit: Diana Russell. Typical cheap display-only swords just don’t have the durability or sharpness to be used for anything other than being looked at. 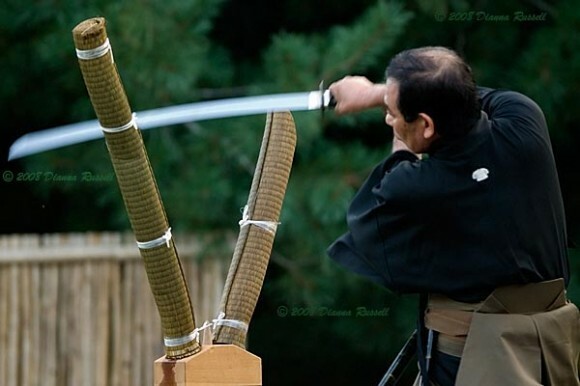 If you want to use your sword for any kind of practicing or cutting, you simply must get a sharpened, battle ready sword which can endure most cutting. Battle ready swords are made of different materials which are of higher quality and forged in a different way, and are almost always full tang (meaning the blade of the sword is extended in the handle as well to make sure it doesn’t break easily). The blade not only has to be sharp, but also be extremely durable. If you paid less than $50 for your sword even if its sharpened chances are you can’t cut anything with it. Even if you intend on cutting lighter materials such as water bottles I wouldn’t recommend it as you might end up hurting yourself in case the sword breaks on impact. Fortunately most combat ready sharpened katana aren’t overly expensive and can be purchased quite cheap. Typically a good role of thumb is you get what you pay for, so for higher quality sharpened samurai swords you should pay a minimum of $100 to make sure they are durable enough. Paying anything over $500 is typically too much as high quality samurai katana can be bought for much less, so don’t go overboard. I also suggest you take a look at some reviews and cutting tests with a sword you choose. Like with any other product the price isn’t the only thing you need to look at and there are some extremely high quality swords you can get for more than reasonable prices. I looked up some for you and below you can find some of my recommendations on sharpened, sturdy swords you can use for training and cutting. I am just curious about the history of sword art. I would love to design my own battle ready sword but would like to find one of the great masters to help me with this project. I am very willing to pay whatever it takes but need to finish designing it first. I am not a collector but am someone who has a deep respect for the swords I have handled and used. Hello, I was interested in knowing if there is anyone that could do the sword maintenance?